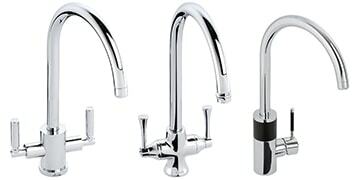 3 way water filter taps provide a way to seamlessly integrate a water filtration system into any kitchen as 1 tap provides everyday hot and cold water as well as healthy crystal clear filtered water. At Aqua Cure we offer Abode's high quality Aquifier filter tap range, which are available in 3 stunning designs and either chrome or brushed nickel finishes. View our range below and don't hesitate to contact us if you require any expert advice.